Soybeans closed higher. Soymeal closed higher. Corn closed lower. Wheat closed lower. Higher US supply weighed on Crude oil. Talk US and China trade talks are on hold helped the US Dollar. Soybean may be supported by talk that recent wet weather may lower the final US soybean supply. Talk that Brazil and Argentina Nov-Jan soybean crush may be greatly reduced may also be supporting soybean and soymeal futures. SX is back near mid August highs and before the August USDA crop report. Some feel drop to contract lows on Sep 18 completed the drop in prices from the end of May highs. Drop from 10.60 to 8.12 was linked in part to US trade war with China. 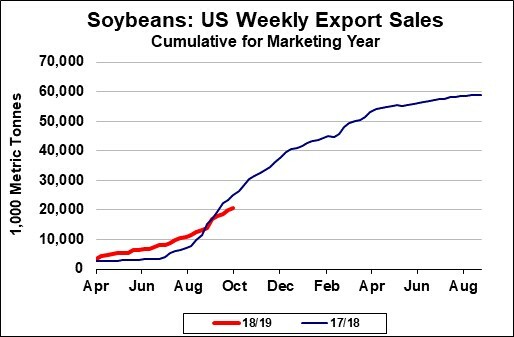 Weekly US soybean export sales are est near 20-25 mil bu vs 16 last week and 47 last year. This would put total commit near 780 mil bu vs 966 last year. USDA goal is 2,060 vs 2,129 last year. Fundamental Bears feel US carryout near 885 mil bu, World carryout near 110 mmt and talk of record 2019 South America supplies should be enough to push prices lower. Lack of US farmer selling may be offering contra seasonal support. Corn futures ended lower and near session lows. Volume remains slow and range narrow. Lack of follow through buying near key resistance near 3.80 CZ may have triggered some long liquidation. Some feel that contract lows near 3.42 CZ on Sep 18 may have completed the drop in prices from the May high near 4.29. Some attribute the slide in prices to trade wars initially with US and Mexico then US and China. CZ had traded back over the 100 day moving average but has failed to test 200 day. Initial support is near 3.72 then 3.65. Weekly US Ethanol production was down from last week but remains above last year. Stocks were above last week and last year. Margins remain negative. 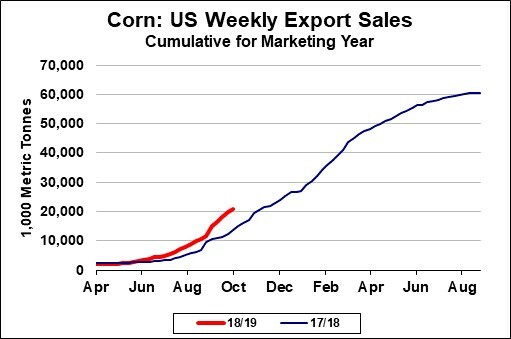 Weekly US corn export sales are est near 40-45 mil bu vs 40 last week 49 last year. Total commit is est near 860 mil bu vs 588 last year. USDA goal is 2,475 vs 2,438 last year. US Midwest should be dry over the next 5 days. Noon 6-10 day added rains for the Midwest. Wheat futures closed lower and near session lows. Lack of follow through buying near initial resistance may have triggered some long liquidation and new selling. For the most part nearby Chicago wheat futures have been In a sideways trading range from early Sep between 5.00 and 5.30. Lower World 2018 supplies offers support. Lack of new US wheat export demand offers resistance. USDA est total US domestic demand near 1,142 mil bu vs 1,078 last year. Food use is est near 970 vs 964. 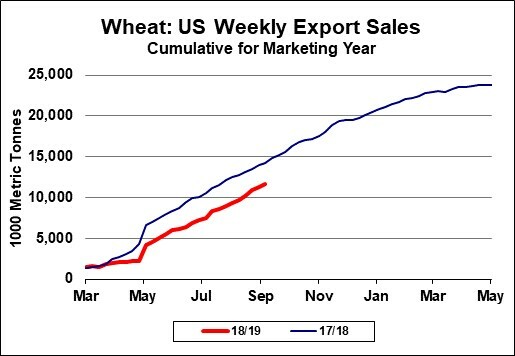 Weekly US wheat export sales are est near 17-25 mil bu vs 12 last week and 23 last year. Total commit is near 440 mil bu vs 544 last year. USDA goal is 1,025 vs 901 last year. Wheat bulls are still looking for a wheat rally early in 2019 due to the 30 mil bu drop in World crop production. Lack of a good bounce in prices suggest drop may not have been enough to push prices higher and USDA export number may be optimistic.